Our wavy edge hook & loop discs will allow you to sand in a wide configuration of convex shapes. They are ideal for bowl turners and general wood turning. The wavy edge extends out beyond the edge of the backup pad so you can flex the disc into contours. These are cloth backed discs not the common paper discs. They will greatly outlast the paper discs. We offer these discs in both 2" and 3" diameters and a wide selection of grits and back up pad flexes. 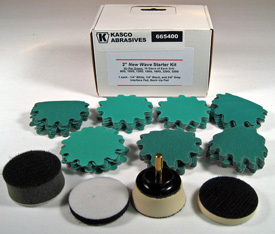 You can order backup pads and interface pads to expand you capabilities. <<<<<< Click on either the 2" or 3" size list in the left column.